In a frying pan, fry the bacon until golden brown, about 3 minutes. Add the apple and water, and stir constantly until this mix softens slightly, about 4 minutes. Add the Brussels sprouts, pepper and cilantro. Stir until all the ingredients are thoroughly integrated. Serve immediately. Cooking Brussels sprouts is very easy. There are two methods to make them that are the simplest: sautéing them or roasting them in the oven. Cooking them with butter and salt is the traditional preparation; add some cheese and cook them au gratin and you’ll have a completely different dish. But you can also combine them with sabores that are perhaps a little unexpected, such as apple. 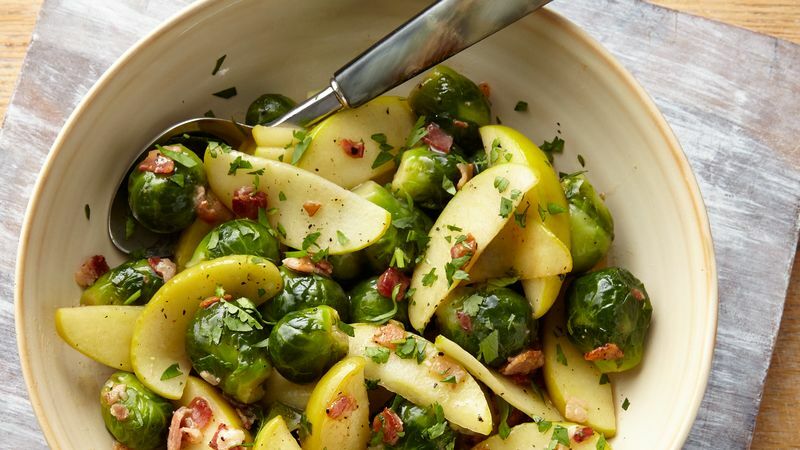 Cooked Brussels sprouts are very tender and fall apart in your mouth, which is why adding a fruit with a crispier consistency makes it a delicacy. All of us are familiar with the rich properties of this vegetable; let’s make it a part of our weekly diet. The recipe below is very simple, quick to prepare and has a combination of incomparable sabores. This dish is perfect as a side served with meat, or as a noon snack.